If you passed today, what would happen to your loved ones tomorrow? Do you have a plan in place to secure their financial well-being, and give them access to your assets? Many people don’t. With the superior legal services from the attorneys at The Cohen Law Office, you can document your entire post-passage strategy and establish true financial assurance according to the law. Our attorneys consider all of your assets, including insurance and property, in order to maximize tax savings and carry out your wishes how you want, down to the smallest detail. It is a common misconception that you need to be sick, wealthy, or elderly for estate planning. This is entirely untrue. If you have a family relying on your income, estate planning can provide much needed assistance in the event of your untimely death. That is why The Cohen Law Office provides prompt, expert advice from experienced law professionals, as well as regular status updates on all procedures relating to your case. Our attorneys make you, our valued client, their number one priority and provide the personalized attention you need to complete the legal process correctly. On this website you will find information on the different types of cases we can handle. 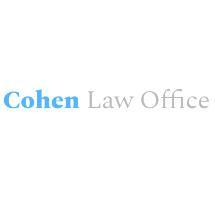 In addition to Cohen Law Office’s expertise, there may be some general information, and links to other legal resources, that may be of interest to you.